← The B.O.R.E.D. Tour X – 2010 Tickets now on sale! 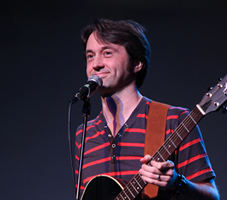 Mike Phirman & Meghan Hounshell to appear at The B.O.R.E.D. Tour X! and, if that weren’t enough to make you BUY YOUR TICKETS NOW, returning to the show is the one and only Meghan Hounshell! Meghan Hounshell’s first comedic performance involved smearing her head with pudding and making loud gurgling noises. While this is a great bit when you are a baby, Meghan soon realized that she might need to move beyond her niche audience. 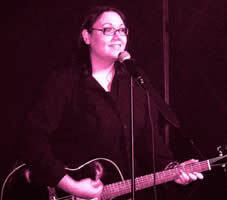 Now, 27 years later as a full-time comic from Seattle, she has traveled all over the country with her trusty guitar, busting out ironic and sublime lyrics to songs like “Punk Rock Baby Farm” and “I’m Not a Lesbian,” and placed in the Top 10 at last years Seattle International Comedy Competition. Meghan has a sordid past, which involves a penchant for church camp outings and a major in Communications (with a minor in International Mime). One of her first songs was the quirky and slightly disturbing “I heart Tom Brokaw.” Now she lives the good life, smoking cigarettes and throwing back shots of whiskey with other comics. Once again we implore you to BUY YOUR TICKETS NOW! They are only $8 and the room only holds 30! DO NOT be left out! Back next monday for even more announcements! With Your Host & M.C.